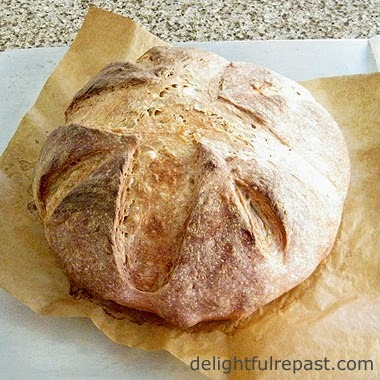 Not everyone has the time, or the inclination, to make homemade bread; but everyone loves it. If you are one of many who liked the idea of the easy baked-in-a-pot no-knead bread but didn't like the idea of hefting a really heavy pot when it's smoking hot, this method is for you. If you have a pizza stone, great. If not, think about getting a Lodge Pro-Logic Cast Iron Pizza Pan instead. 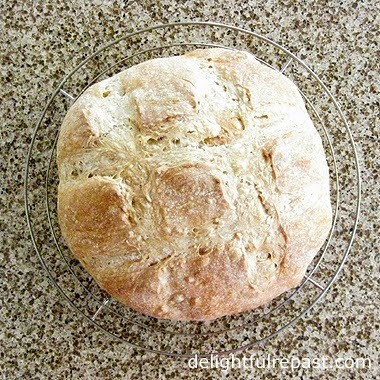 I've had mine for several years and use it like a pizza stone for both pizza and rustic loaves. It's much easier to get the dough on and off a flat surface than in and out of a deep pot. This is so easy to make, you can stir up a batch every day if you like. We don't use quite that much bread usually, so I just start a batch every other day. It just sits on the counter, so you don't have to find space in your refrigerator for a big bowl. Yes, it's easy, even foolproof; but more important, this is some seriously good bread. And it makes really great toast for breakfast or bruschetta or crostini. My name is Jean, and I am a breadaholic! How much do you like bread? What kind? When? 1 Start dough 22 hours* before you plan to serve the bread. In large bowl, whisk together flour, salt and yeast. Add water and stir with dough whisk or large spoon until the dough just comes together into a sticky dough with no dry flour left in the bowl. Cover with lid or plastic wrap and let stand 18 hours* on countertop. * If that doesn't suit your schedule, you can make that a couple hours less or more. 2 Line a rimless baking sheet (or a rimmed one turned upside down) with a square of parchment paper. Turn dough out onto lightly floured surface and press out lightly with your fingertips to a 10- to 12-inch square. Fold it in thirds, like a letter, then in thirds again. Round off the square, tucking edges under to form a ball. Place smooth side up on parchment-lined baking sheet. Cover with a large clear bowl or, as I do, with a 10-inch-diameter cake dome. 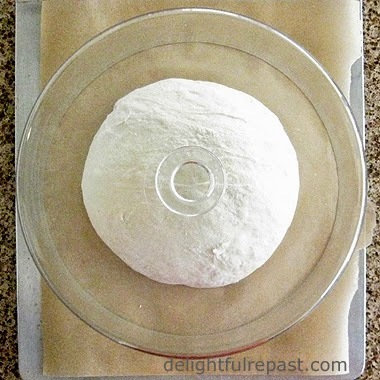 Or spray the dough lightly with cooking spray and cover lightly with a piece of plastic wrap. Let rise 1 1/2 hours. The dough will spread more than it will increase in height. 3 After an hour, place pizza stone or cast iron pizza pan on top shelf in the middle of the oven. Preheat oven and pizza stone or pan at 500 degrees for 30 minutes. 4 Using a lame (pronounced lahm), razor blade or very sharp knife, score the top of the loaf. Holding the blade straight, make each cut quickly and about 1/4-inch deep. You might have to make the cuts twice. I like a simple tic-tac-toe pattern (see photo above the recipe) or the pattern pictured below. If the blade seems to be dragging, wet it before each cut. Brush the dough with a little water. Note: Brushing the dough with a little water with my OXO silicone pastry brush is much simpler than filling up a spray bottle and spraying the loaf. 5 Carefully slide the dough (on the parchment) onto the stone or cast iron pizza pan and reduce heat to 425 degrees. Bake about 45 minutes, or until the crust is beautifully golden and middle of loaf registers 210 degrees on an instant-read thermometer. 6 Slide the rimless baking sheet under the bread to remove it from the oven; let cool on wire rack for 1 1/2 to 2 hours. If not eating right away, you can re-crisp crust in oven at 350 degrees for 10 minutes. It's best the day it is baked but can be kept, wrapped in foil, at room temperature for up to 2 days. Or keep cut side down covered with a towel to preserve the crust's crunch. 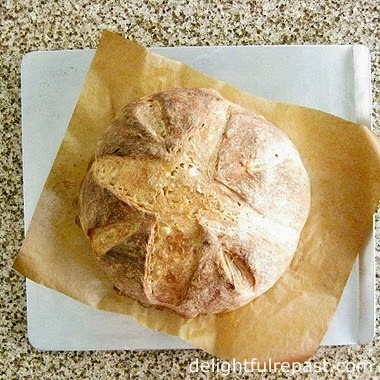 Note: Check out Homemade Bread - A Roundup of 10 Favorite Yeast and Quick Breads. 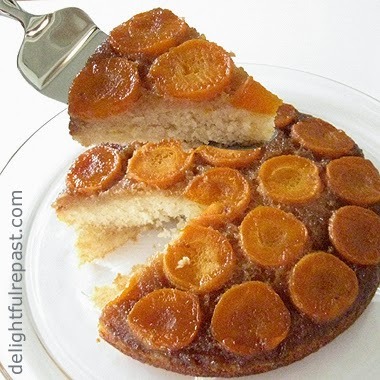 Apricot upside-down cake, especially this one made with almond meal (also called almond flour or, in the UK, ground almonds) and just a dash of almond extract, is the perfect midsummer dessert. If you don't eat almonds, simply replace the almond meal with an equal measure of flour and leave out the almond extract. Apricots and almonds have an affinity for each other, so unless you're allergic to almonds I hope you'll try it. Just don't increase the amount of almond extract as it can be quite overpowering. As you know, I appreciate subtlety rather than being slapped in the face by heavy-handed flavors. 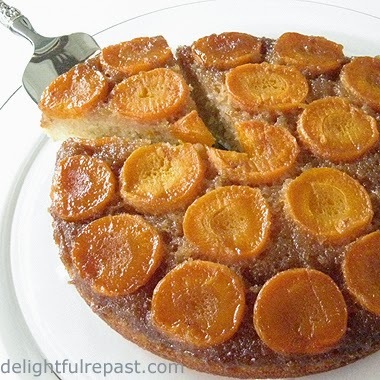 As I poured the batter into the pan, I was regretting putting "plus 2 tablespoons milk," thinking the cake was going to be too light to support the apricots. I needn't have worried. The cake didn't collapse even a smidge when I turned it upside down and lifted the pan away. Summer fruit is just about the only thing I like about summer! How about you? I hope you're having a super summer! Note: For a gluten-free cake, replace 3/4 cup flour with 1/4 cup sorghum flour, 1/4 cup potato starch, 1/4 cup tapioca flour and 1/2 teaspoon xanthan gum. 1 Halve and pit the apricots. Preheat oven to 350 degrees. Spray the sides and bottom of a 2-inch deep 8-inch round cake pan with vegetable spray, line bottom with a round of parchment paper, and pour the melted butter in the pan. Add the brown sugar to the butter and blend. Starting at outer edge, arrange apricots, cut side down, in single layer in bottom of pan and press lightly to make them stick; set aside. 2 In large mixing bowl, combine flour, almond meal, sugar, baking powder, salt and mace; mix on low speed for 1 minute to "sift.". Add the softened butter; mix on low speed for 1 minute. Add milk and extracts; mix on low speed for 1 minute. Add the egg; mix 1 1/2 minutes longer. 3 Spread the batter carefully over the apricots with a rubber spatula. Bake at 350 degrees for about 35 to 40 minutes. Remove from oven, let stand for just 3 minutes, loosen edges with knife and invert onto a platter. Carefully peel off parchment paper. Let cool about 45 minutes, or up to several hours, before serving slightly warm or at room temperature. Serve with vanilla ice cream or lightly sweetened whipped cream. 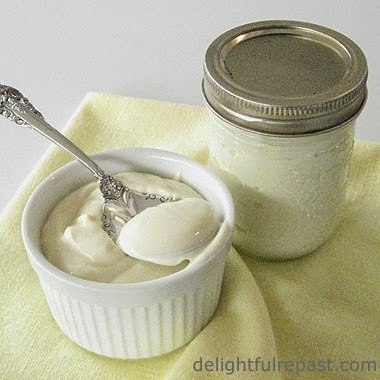 Homemade mayonnaise is something I hadn't made in years. There was a time when I was a purist and insisted on making it by hand with a large whisk a la early Julia Child. Of course, even she embraced the food processor when it came along. I had already mastered handmade homemade mayonnaise before my squeamishness about raw eggs set in. 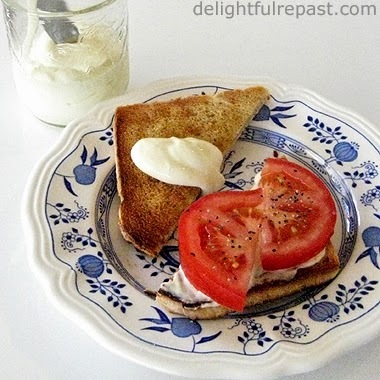 Once I became concerned about salmonella in raw eggs, my homemade mayonnaise days were over. But recently I decided to try heating the eggs just enough to kill any salmonella bacteria, as suggested by food scientist Shirley Corriher. My recipe was inspired by the one I found in the Cuisinart instruction and recipe booklet. The ingredients are about the same as my old handmade mayonnaise recipe, except I used only yolks in the handmade. Be sure to use the freshest eggs and oils for your mayonnaise. Eggs lose some of their emulsifying ability as they age, and oils can turn rancid and take on "off" flavors. Taste the oils you plan to use; if they don't taste good, your mayonnaise won't taste good. Canola oil gets a bad rap, but if you source it carefully it's a great oil. I always buy non-GMO organic expeller pressed (pressed without chemicals and high-speed presses that generate heat) oil. 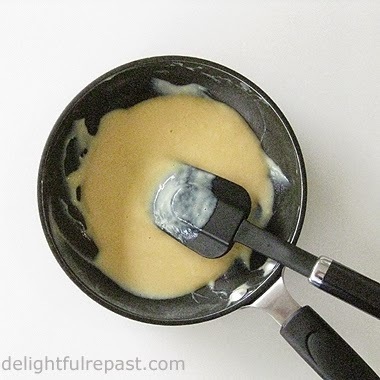 1 In 1-quart bowl, whisk together the egg, yolk, water, lemon juice, vinegar, sugar, flour, salt and dry mustard. Whisk vigorously for 1 minute, until mixture is smooth and frothy. 2 Transfer the mixture to a small nonstick skillet and heat over very low heat, stirring with a spatula, until the mixture starts to thicken. It should register 160 degrees on an instant-read thermometer; do not allow mixture to reach 170 degrees. Remove from heat, set pan in another pan of ice and water, and stir until the mixture has cooled. 3 Measure the canola oil in a spouted 2-cup glass measure and the olive oil in a spouted 1-cup glass measure. Insert the chopping/mixing blade in the work bowl of the food processor. Add the egg mixture to the work bowl. Process for 1 minute. Scrape the sides of the work bowl. 4 With the machine running, start adding the olive oil through the small feed tube very slowly, taking about a minute to add the 1/4 cup (that's 5 seconds per teaspoon). Scrape the work bowl. 5 Insert the small pusher in the small feed tube. With the machine running, pour the canola oil into the pusher, 1/4 cup at a time (taking about 30 seconds to add each 1/4 cup), allowing the oil to drip slowly through the hole in the pusher into the emulsion. The mayonnaise will thicken as the oil is added. Taste and adjust seasoning. Update 06/29/16: One reader, Lily, likes this recipe and came up with a great idea. She uses a little plastic bear that honey came in to add the oil drop by drop to the mayo. She measured in the oils and marked the line on the outside of the bear so she can fill it without measuring. 6 Scrape mayonnaise into a glass jar or container, cover and refrigerate. Can be refrigerated up to 4 days. I rarely use that much mayonnaise in such a short time, so I divide it between two jars and give one to a friend. Disclosure: Cuisinart provided the product mentioned above. I only work with brands I love, and all opinions are always my own. I will never recommend a product that I haven’t used myself and liked! This post contains Amazon affiliate links, which means I will receive a small commission (at no cost to you) on items purchased via these links. If your own garden isn't overrun with zucchini at some point this summer, you no doubt have a friend, neighbor or coworker bringing you bags of the stuff from his garden. Fortunately, you can do a lot with zucchini--from main dishes to desserts. 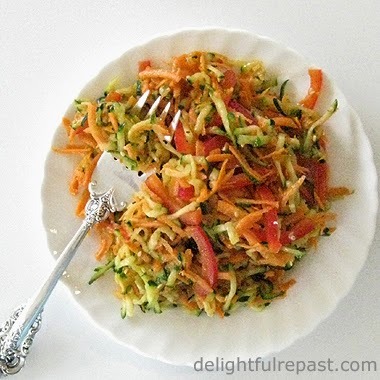 Here's my zesty zucchini salad for a too-hot-to-cook kind of day. I didn't plant any this year myself. I just knew I wasn't up to riding herd on a rambunctious zucchini patch. It's a very rewarding plant for beginners or gardeners who lack confidence -- no matter what you do, it flourishes and makes you feel like the real deal! Next time I'm going to try the salad spinner and see if it works as well as the squeezing method. Wouldn't that be a boon?! If you've "wrung out" salted shredded zucchini in your salad spinner, or ever do, let me know how it works. What do you like to make with zucchini? 1 Shred the zucchini. Place it in a colander set over a bowl. Sprinkle with the salt and mix it in. Let stand for 20 to 30 minutes. A lot of liquid will come out. Squeeze handfuls of it to get more liquid out. Then place it in a flour sack dish towel or couple of layers of unbleached paper towels to give it a final squeeze. Put the zucchini in a 1.5-quart bowl. Shred the carrots and slice the red bell pepper (I used my new Wusthof Classic 6-Inch Extra-Wide Cook's Knife), and add them to the bowl. Sprinkle on the toasted sesame seeds. 2 In small bowl, whisk together the sugar, ginger, pepper and mustard. Whisk in the sesame oil and soy sauce, making sure the dry ingredients (particularly the ginger) are not clumpy. Whisk in the vinegar and olive oil. Pour over the salad, and toss to coat. Cover and chill for 1 hour or up to 1 day. When I was asked to bring a vegetable platter to a party last weekend, I said to myself, " No matter how busy I am, I am not going to pick up one of those boring supermarket ones with store-bought ranch dressing." Besides, they're not organic. Three dozen guests were expected, so I decided to use my heavy-duty half-sheet pan rather than a platter. It's big, but I still didn't have room for all the organic vegetables I bought. I do like homemade ranch dressing, but ranch has become a bit of a cliche on vegetable platters, so I made a three-cup batch of a favorite dressing of my own invention. I had no idea what to call it, but you have to call a recipe on a blog something. 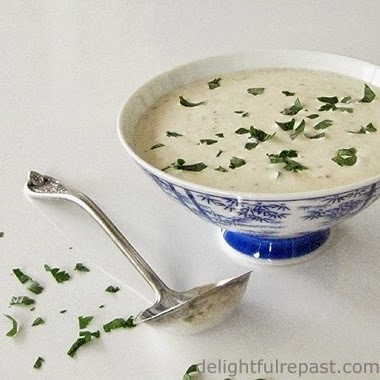 So how about Homemade Caesar Dressing or Sorta Caesar Dressing? Or maybe Caesarish Dressing? Anyway ... the recipe is below. My new Wusthof Classic 6-Inch Extra-Wide Cook's Knife, recently sent to me for review, really made quick work of that huge pile of vegetables. I love my Wusthof Classic 8-Inch Cook's Knife and will continue to use it for certain tasks, but this shorter (but just as wide) knife instantly became my all-time favorite knife! WÜSTHOF Classic knives have extremely sharp blades with exceptionally long edge retention. And the handles just feel "right" in my hand. That and the right blade length for both the task and one's hand make up the right "fit," which is key when choosing a knife. 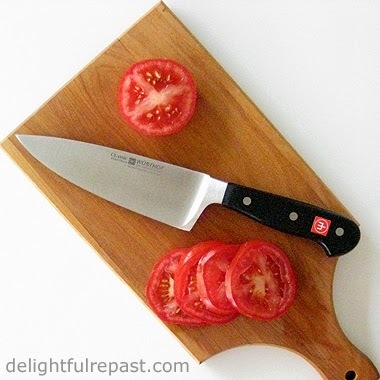 This is such a well-balanced knife, I feel like I could go on chopping for hours! Tell me about your knife situation, and enter the giveaway below. Just whisk the ingredients together, cover and refrigerate until serving time. One winner will receive a WÜSTHOF Classic 6-Inch Extra-Wide Cook's Knife 4584/16cm from WÜSTHOF. All US residents who leave a comment about knives (one entry per person - and please include your email address in the body of your comment) on this post before 11:59 pm Eastern time Wednesday July 9 will be put into a random drawing. Winner will be announced here in the comments before noon Eastern time on Thursday July 10. If I don't hear back from the winner of the random drawing by 11:59 am Eastern time Sunday July 13, another drawing will be held and a new winner selected from the original entrants (those who commented before the giveaway deadline). Buy It Now Wusthof knives, including the Wusthof Classic 6-Inch Extra-Wide Cook's Knife, are available on Amazon. Disclosure: WÜSTHOF provided a knife for review purposes and for the giveaway. I received no compensation. The views expressed here are entirely my own. I always tell my readers what I really think!